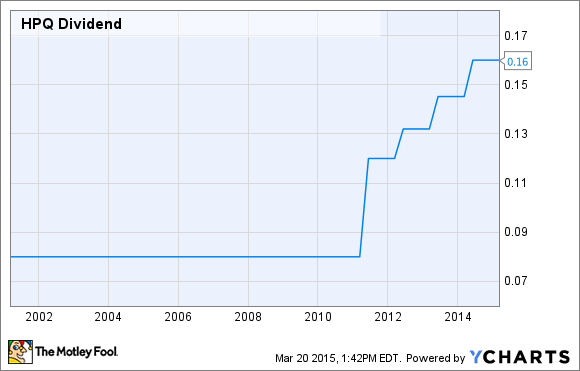 Can Hewlett-Packard Really Afford This Big Dividend Boost? Hewlett-Packard just boosted its dividend payouts by 10% once again. It's a nice and empty gesture. Here's what HP should have done instead. Technology powerhouse Hewlett-Packard (NYSE:HPQ) is in the middle of a difficult turnaround effort. Management is pulling out all the stops. Come November, the company will even split into two new businesses in order to move the hoped-for improvements along. That doesn't stop Hewlett-Packard from spending big every once in a while. This week, for example, HP announced the size of its next dividend payment. It will be 10% larger than the current quarterly check, jumping to $0.176 per share. From one point of view, this is exactly what investors might expect HP to do. This is the fourth consecutive annual dividend increase near the 10% mark. Before that, HP launched a massive 50% increase in 2011 to make up for about a decade of unchanged payouts. HPQ Dividend data by YCharts. So yeah, you could say that HP simply continued drawing the next expected section of the chart above. But that doesn't necessarily mean it's a good idea. HP could put that money to better use in many ways -- for example, issue a token, minimal dividend boost just to keep up appearances, then use the rest to actually improve the business. Let me present the one alternative cash investment I think would have helped HP the most. Invest in innovation? But it's so expensive! Hewlett-Packard went through an era of ruthless cost-cutting over the last two decades. The company now spends just 3% of its revenues on research and development, down from double or even triple that percentage back when HP truly mattered. You can cut your way to improved profits, but that's not how a massive tech company generates the innovation it needs. Anemic R&D budgets may help the bottom line today, but they will crush the business from top to bottom in the long run. You can often judge the long-term quality of a tech company by its research expenses. Google (NASDAQ:GOOG) (NASDAQ:GOOGL), for one, keeps raising its R&D budgets faster than it can grow sales. The company's research costs now account for 15% of Google's sales, up from 8% a decade ago. 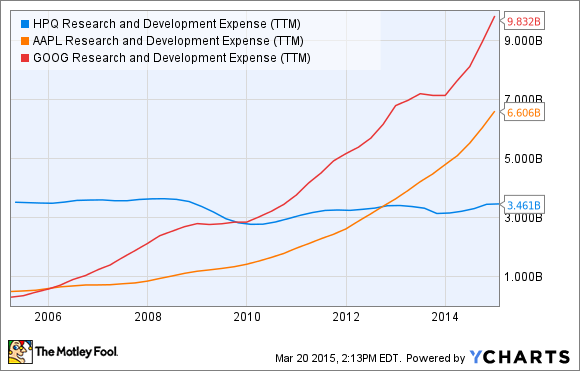 HPQ Research and Development Expense (TTM) data by YCharts. In short, following the likes of Apple and Google into massive research budgets would have been the most obvious way to actually give the company a fighting chance. The upcoming business split is a nice idea, but HP CEO Meg Whitman is doing it wrong. And throwing ever larger bundles of cash at investors may be a nice gesture, but it won't help the core business at all. Sorry, HP. You could have skipped this 10% dividend boost and set the money aside for a fresh start in real innovation instead. Hire the best minds in Silicon Valley, give them all the tools they need, and ask them to do something amazing. Throw your money around because that's how you make it work. That's what Google and Apple are doing.